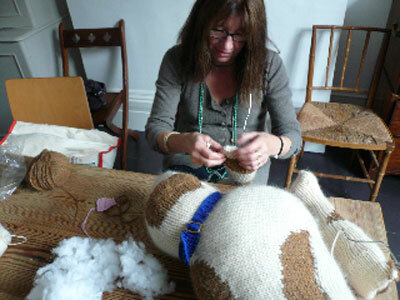 We have just been working on a particularly exciting commission. 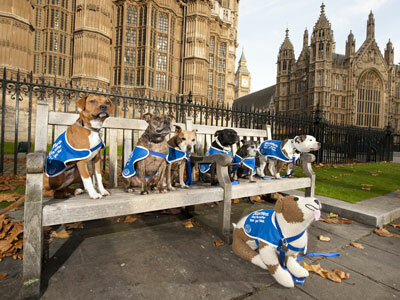 Battersea Dog’s Home asked us to make a life-sized Staffordshire Bull Terrier, for their ‘Staffies they’re softer than you think’ campaign which was launched last week. And here it is finished – looking, as I’m sure you’ll agree, pretty damn soft and cuddly. We’ve also given them a pattern for a small version, larger and more toy like than our usual dogs, but very much smaller than this magnificent beast. 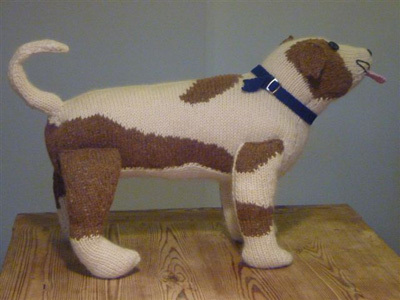 If you’d like a pattern here is the link to their website and it’ll cost £2.00, worth every penny and it all goes to the dog’s home. 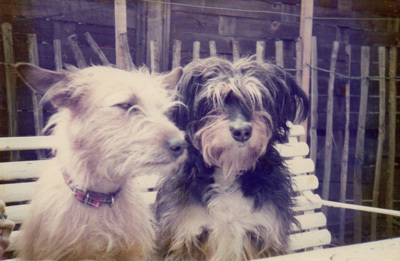 Jo and I are very attached to Battersea Dog’s Home, as we both got our first dogs from there, Alice and Fanny, RIP. Here they are. 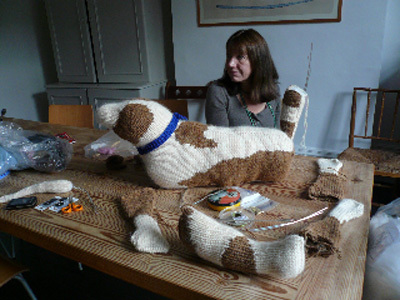 Also we are about to start work on our new book Best in Show knit your own dog 2, or Second Best in Show, or Dogs 2, or…..not quite sure what it’ll be called, but we are doing a second book of knitted dogs, as there are SO many dog breeds that people are clamoring to knit, which we couldn’t fit into our first book. We would very much welcome any suggestions, do please email us with any dogs you would like us to include. – we’ll send you a free hamster house pattern as a reward.